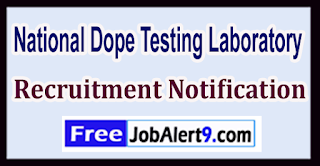 NDTL (National Dope Testing Laboratory) Has Released Recruitment Notification For 03 Scientist, Analyst, Laboratory Attendant Posts. All Eligible & Interested Candidates Can Apply Offline. 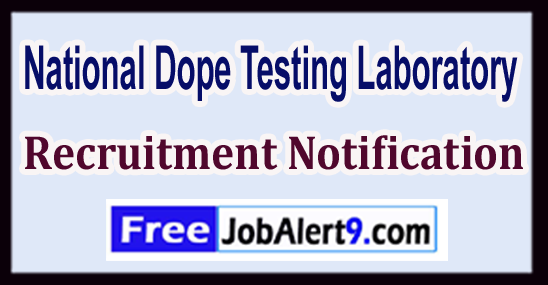 Further Detailed Information Regarding Educational Qualifications, Age Limit, Selection Procedure, Exam Pattern, Syllabus for NDTL (National Dope Testing Laboratory) Recruitment 2017 - 03 Scientist, Analyst, Laboratory Attendant Post is mentioned below. Age Limit - Candidates upper age limit should not Exceed 45-Years (Post 1), 35- Years (Post 2), 25- Years (Post 3). Pay Scale - Rs. 15,600 - 39,100/- With 6600/- Grade Pay (Post 1), Rs. 9300 - 34,800/- With 4600/- Grade Pay (Post 2), Rs. 5200 - 20,200/- With 1800/- Grade Pay (Post 3) . How To Apply - All Eligible & Interested candidates Can Download application Form through official web-site (http://ndtlindia.com). After Filling The application form, candidate must send by hard copis of application a long with relevant testimonials (Mentioned In Detailed Advertisement) to the following Address before / (12th June 2017). Address -Administrative Officer National Dope Testing Laboratory (NDTL) Ministry of Youth Affairs and Sports Jawaharlal Nehru Stadium Complex, East Gate, Near MTNL Building, Lodhi Road, New Delhi – 110 003 . The Last date For Acceptance of Application Forms - 12-06-2017. Click Here For NDTL Recruitment 2017 Detailed Advertisement & Application Form.